Paradigm Shifters is a series of interviews with a select group of women and men from eclectic walks of life. It will highlight unspoken, real-life insights on how they have been able to turn weakness into strength. A naked soul point of view of how their breakdowns were really a preparation for breakthroughs. They are your quintessential paradigm shifters; internal shifts converted into genuine change. Everything I have ever done has been focused on this underlying theme of shifting the paradigm because, "What we think determines what we feel and what we feel determines what we do." Hence, why Empowered by You takes lingerie, which has traditionally been seen merely as a tool of seduction and redirected that energy as a tool of empowerment. I hope from these stories you will look at your own situations, struggles and accomplishments through a different lens. At the very least you will be more equipped with real life tools to change your own paradigm. At the end of the day, we are our own Alchemist turning the silver we were born with into the gold we are destined to become. You were recognized in Forbes as the #3 woman with the fastest growing women owned business! Congratulations on the incredible growth from 3 million to 48 million in two years! Tell me about what led you to creating Orange Theory Fitness and what do you credit such success to. I have a Bachelor's Degree in Physical Education and a Master's Degree in Physiology. I have been in the fitness industry for four decades. About ten years ago I had this pilates studio and had been managing spas and gyms forever. Group fitness is really my forte. I really enjoyed teaching pilates but the only problem with pilates is there's no metabolic work. So I decided to move the studio into a bigger space and I put a metabolic workout in there. When I looked at the metabolic workouts, spinning, boot camps, etc., I couldn't find a workout that I saw that scientifically met all the needs to achieve results. I also wanted a workout that wasn't just for the 10% of fit people who attended the group fitness classes. I wanted a workout that the maybe not conditioned people didn't feel scared to attend. With this in mind I decided to create my own. Do all the studios have a similar format? Yes, it's just simply that metabolic workout. There a 3,000-5,000 square foot room and they have what we call the "Orangetheory Workout". The Orangetheory Workout is based on five zone heart rate training. Many people forget about the importance of heart rate training. 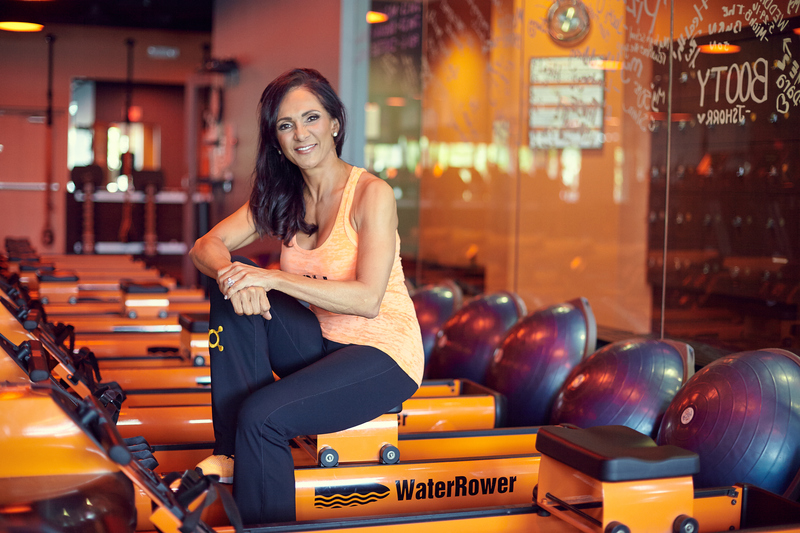 The Orangetheory workout also combines cardio and weights, which is the best metabolic workout. While the workout is happening we monitor their heart rates so we can acclimate to their conditioning levels. We also have a lot of equipment that helps achieve the power you'd maybe get in a crossfit class but in a non-impact way. For example, our rowing machine we use for power and it's just so much easier on your knees then jump squats. Your company has a wonderful "I burn for..." motto. What do you "burn for"? I burn for the amazing human body. I actually wrote a book and am in the process of writing another one on how great fitness results are achieved so anyone can achieve them at home. Recently, I asked people to send me what the workout has done for them and I received maybe two hundred emails raving about Orangetheory and how it has allowed them to become a better version of themselves. I burn for every email they sent me. Hindsight is a beautiful thing. However, some of our biggest breakthroughs come from moments that seemed at the time like breakdowns. Can you name one? I was a single parent, my son was nine years old, and I lost my job. It was the most frightening time of my life. The beauty was, I had this amazing father who was a football coach and P.E. teacher. He taught me "momentum shifting up". As a coach he believed you should coach your players to focus on what they have and not on what they don't have. He also parented us like this. This is what got me through that time in my life. I focused on what I did have, which, at the time, was a pilates certification. So, I started doing pilates classes in my house and it got to the point where I would have all these women pulling in and out of my driveway. I did this for not quite a full year until I got the nerve and momentum to open up a small pilates studio. Opening that studio started the whole ride of me becoming an entrepreneur. The breakdown experience itself taught me how to push through very uncomfortable moments by concentrating on what I have, not what I didn't. What kind of legacy do you wish to leave behind? I just truly believe it is changing the world one heartbeat at a time. I mean literally taking each heartbeat of those 300,000 individuals and allowing them to be the best individual they can be. I believe when you challenge your body and keep it fit, strong, and healthy you're going to be the best version of you: as a parent, in your career, in whatever you're doing. On such a huge scale I know I can affect so many individuals. Exiting the world knowing that I had a positive effect on so many individuals is beyond anything I could ever desire to do in this world.